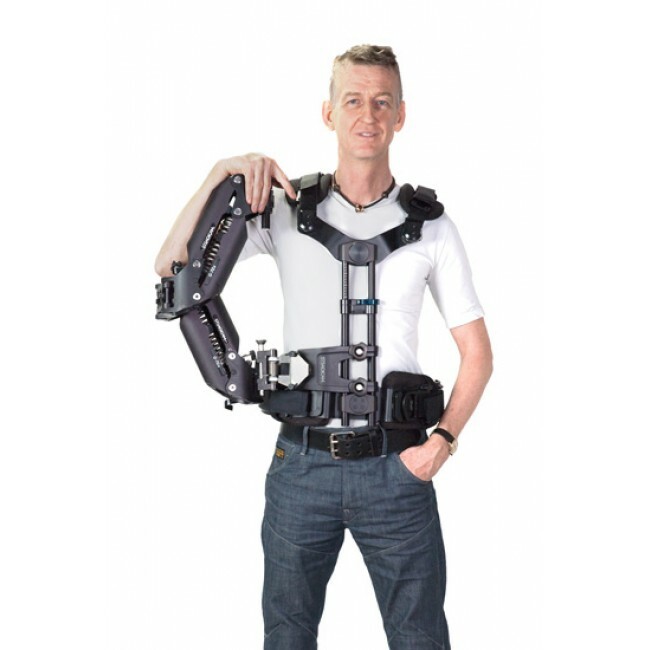 Steadicam® Exovest™ designed by Chris Fawcett The Steadicam® Fawcett Exovest™ is a semi-rigid exoskeletal vest that transfers the weight and torque of supporting a Steadicam® system into anatomically appropriate areas, without interfering with natural movement. 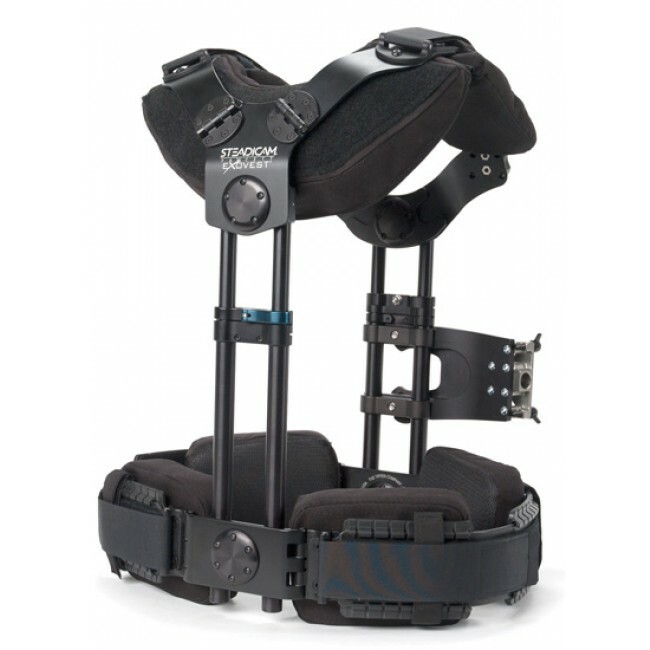 Primary weight transfer is to the pelvis via four pads ergonomically placed around the waistband, and primary torque transfer is via a pad system at the upper back. Lower pads avoid compressing the abdomen in front, and the base of the spine in back. Upper pads avoid compressing the neck, shoulder joint, shoulder blades, and spine. Crucially, the absence of chest straps allows for unrestricted breathing and arm movement. 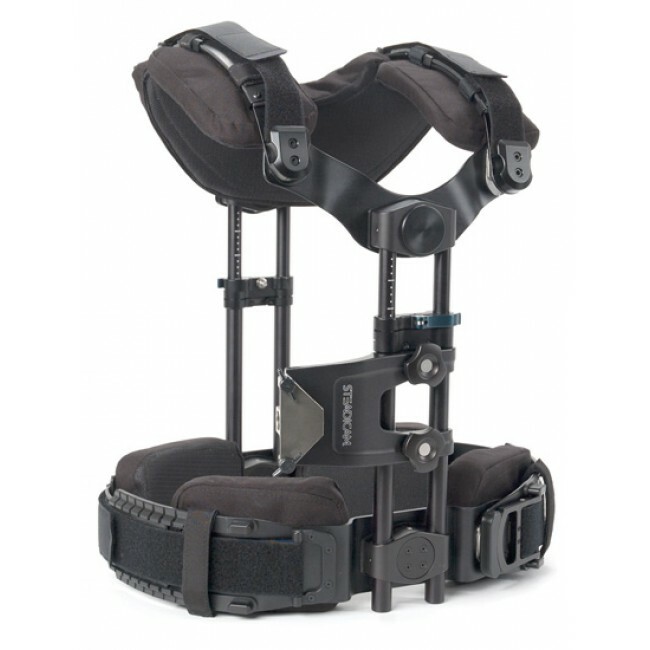 Pad systems are connected by rigid sliding components, and tightened by double and triple-purchase straps for precise fit under load, so weight-bearing characteristics can be fine-tuned on the fly. 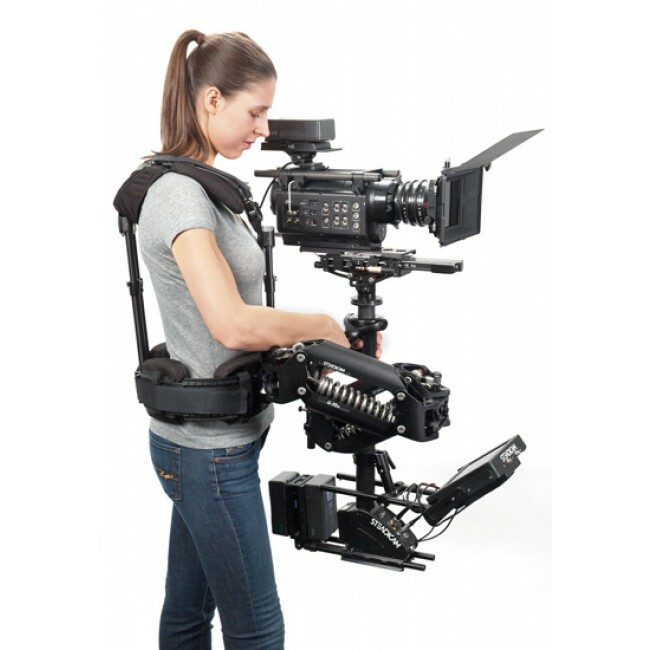 The exemplary rigidity of the outer structure extends the torque-resisting lever-arm from mid-back (on existing vests) to high-shoulder level—halving the force required to counterbalance a Steadicam rig. Symmetrical twin-rod spars, rising fore and aft from the waistband, increase vertical range of the socket block and uniquely, permit both front and rear arm mounting. Four integral pivots allow the vest to conform to natural body movements. The rise and fall of the hips as weight is shifted from one leg to the other is accommodated by a lower pivot system, so the socket block remains level, and at the same height when walking—resulting in less muscular strain, and better overall stability and balance. The upper system allows free movement of the shoulders. The resultant feel is of increased lightness and control. Between takes, the entire vest may be relaxed by means of one over-center lever, as the upper pad system beds in only under load. Compared to conventional vests, the Fawcett Exovest is lighter and less constrictive—allowing for better respiration, circulation, transpiration, and movement and is especially comfortable for female operators. 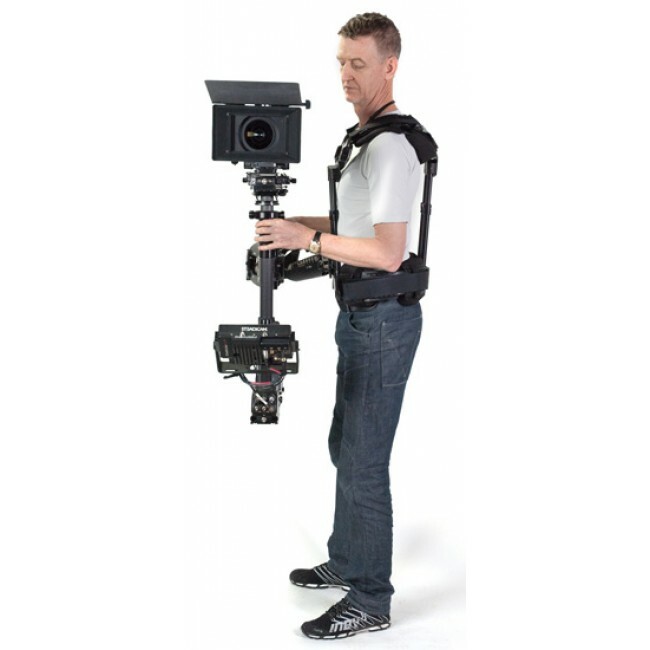 Chris Fawcett operates and teaches Steadicam® worldwide and has extensively studied the physiology of human weight-bearing appliances. 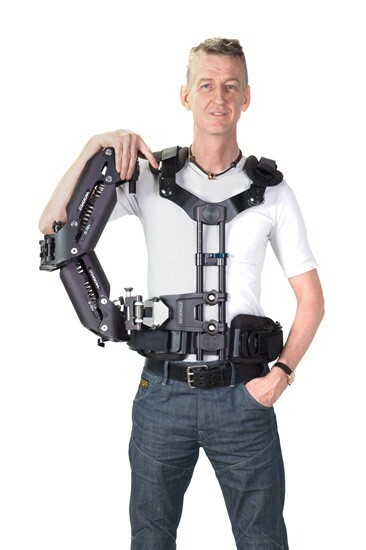 He is the author of Steadicam® Posture. The Fawcett Exovest comes with a standard three year parts and labor warranty, backed by the industry pioneers and leaders in camera stabilization.